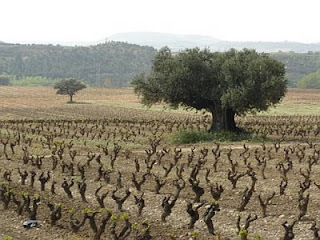 CVNE produces many different Rioja wines from the more classical Rioja style to the heavier, riper, oaky(er) new world style. However, even for the riper style, their wines remain balanced, juicy, earthy and true to their Terroir. 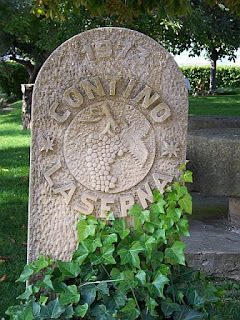 Contino is one of the prestige cuvees of CVNE, along with their reknown Cuvee Imperial (more Bordeaux style) and Vina Real (earthier, more Burgundian style). It was established in 1974, in a separate estate (from the main CVNE winery) in Laserna, Rioja Alavesa, a few miles from Laguardia. (FYI: CVNE is located in Haro and Vina Real is nestled on the top of a hill overlooking Logroño, called Cerro de la Mesa). Contino is, somewhat, a single-vineyard plot of a bit more than 60 hectares of vines, surrounding a beautiful several century old spanish farm house. It produces a Reserva and Gran Reserva (only in very good year), a unique wine made from the unusual varietal Graciano (usually blended with Tempranillo) and the incredibly satisfying "Vina del Olivo" coming from a small parcel planted right in front of the farm, easily recognizeable with its very old Olive tree in the middle. The Ebro river curls around the vineyard, forming like a horse shoe shaped platform gradually expanding and descending from the estate to the river. Protected by surrounding hills and contrasted by the Ebro River, this very particular location, like a "bassin valley, creates an ideal micro-climate protecting and offering some of the best conditions to grow great vines: the vines exposed to the south take a maximum of light from morning to night; the gentle slope descending to the river has a natural, perfect drainage; the air remain fresh and moist because of the river proximity (also protecting the vines during winter), the soil is rarely dry even during the extremely hot summer months, allowing a good acidity and freshness in the wines (especially important since 2000, in this decade of moody weather across the globe with extreme temperatures). I can proudly say that I met and know Jesus Madrazo, the son of Jose Madrazo who bought the property in 1973 in the sole aim to produce high quality wine from a single vineyard, bottled at the estate, in the league of the best Chateaux from Bordeaux. Following his father's step with even more conviction, Jesus is a great guy, funny, generous and passionate about wine and winemaking. He nurtures his vines and wines like his own kids, taking the time to experiment, comprehend, taste and improve a bit more every year to achieve the highest possible quality wine he can make. 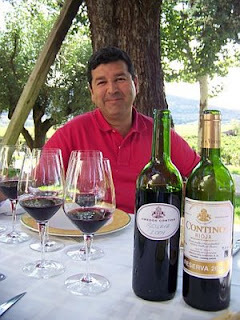 Over my last 17 years of wine tasting and wine buying experience, many producers told me that "a wine often reflects the character and the personality of the winemaker behind it", well, it is definitely true for Jesus Madrazo, his bonhomie, "bon vivant", generous and attentive, gentle attitude are evidently reflected in his wines. I went there to taste the new vintage at the barrel, the current vintage and older bottlings, 5 years in a row between 2003 and 2007. Everytime, it was a delight to be there and Jesus knows how to welcome his guests. The last time, in september 2007, my wife, my son and I were eating with him in the garden facing the "Vina del Olivo". We tasted samples of the promising 2004 vintage Reserva, and the barely finished 2006 vintage at the barrel. With the lunch, we tasted 2001 Contino Reserva, 2004 "Vina del Olivo" (fantastic, one of my favorite higher end Riojas in this vintage) and 2005 "Graciano" (a really pleasant surprise and a must have for wine connoisseurs) served with some Pata Negra Ham and other Spanish specialities. It was a lovely sunny day and a memorable moment. I'm looking forward to my next visit but I'm under the impression that Jesus is no longer working there no more (unless someone can correct me on that). However, I used to sell the last 4 or 5 vintages in the previous store where I used to work, but I didn't have any in the current one. So I decided to buy the current available vintage of their Reserva and I'm really pleased with it. I bought it because I love the wines from Contino but also for all the good memories that come with it for me. 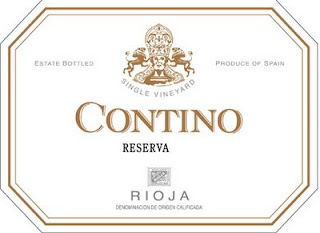 2000 Contino Reserva is riper, more concentrated style of Rioja, compare to some of its sibblings like "Vina Real" or even "Imperial". Due to its richness and long oak ageing process, the wine normally takes quite a few years to settle down, be ready and offer its best expression. However, 2000 being less concentrated and less ripe than recent vintages like 2001, 2004, 2005 and 2007, now is a good time to start enjoying it. The color is quite dark and intense. The nose mixes aromas of ripe red cherry and black berry intermingled with oak, spice, mocha and leather. The palate is smooth, balanced and quite generous despite the bit of age and the vintage. It displays even more red and black berry flavors, with mocha, minerals, earthy hints and present yet integrated, harmonious oak notes. The finish, which possesses this dry, oaky earthiness proper to Riojas that I love, is fairly long and really inviting. 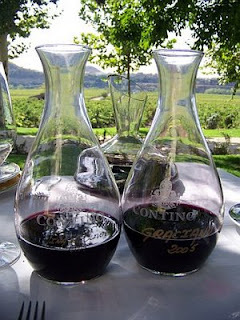 It revealed most of its complex layers after about 20-30 minutes of decanting. Very nice now, it will still evolve and integrate for a few years, in my opinion, it will keep most of its fruit for the next 3-5 years and should keep for a little while after that. I dedicate this little post to Jesus Madrazo (where ever you are now) and his wines, for his warm welcome each time I came to the estate (especially when I came with my little family) and allowing me (us) to taste with him and share a bit of his time, seating in the garden of this magnificent property and drinking fabulous wines. Gracias Jesus! (for you and for your wines). For more info about the winery go to www.CVNE.com, or simply google it, many articles have been written on the subject. FYI: "La Nansa" means "fish net" which explains the sort of "hamac" or "fish net" on the label. And "Vino de Aguja" litterally means "wine of needle" referring to the small size of the bubbles. This is the reason why this wine can also found under "Pearl wines", also referring to the pearling sensation in the palate. Made from 60% Grenache and 40% Merlot, this rose wine has been produced following a second fermentation in an isobaric tank. Thus the bubbles in this "pearl wine" with a pressure of approximately 2 bar. Bright red color, slightly bubbling, this wine is light, with a fruity mouthfill. Pleasant red berry, raspberry and strawberry flavors pretty much defined this fun, uncomplicated summery wine. No added sugar, it doesn't taste sweet but slight fruity. Fresh and simple, easy to drink, it will be good for picnic. Yesterday, before leaving the store, I had the enjoyable pleasure to taste a great 1999 Barbera d'Asti from Trinchero (not to be mistaken with Trinchero winery in Napa Valley). Great nose, very attractive and expressive, with aromas of ripe dark cherry, figs, truffle, mushroom, animal, forest floor, somewhat old prune liquor, leather, stony minerality, and hints of smoke and tar. The palate is very polished, earthy, juicy, with layers of the same type of flavors with more smokey, earthy tones intermingled with dark berry and spice accents. Following the juicy attack and the expanding mid-palate, the long finish possesses dark, earthy, dry tannins and more smoke, mineral, earthy and animal attitude. Very enjoyable wine. Lovely venison, wild boar, forest animal will pair fantastically with this wine. Along with some of my favorites old school, traditional Rioja's wineries - like La Rioja Alta (Vina Ardanza), Lopez de Heredia (Vina Bosconia and Tondonia), Bodegas Riojanas (Gran Albina), CVNE (Vina Real), Marques de Murrieta (Castillo Ygay), Marques de riscal (Reserva and Gran Reserva) -, Marques de Vitoria is also an old school, traditional Rioja's winery. You don't really hear from it because it is very often underated by the prees and overlooked by most Spanish wine lovers. However, I think that people should pay a bit more attention to this winery. I used to sell the 2002 Crianza which was a bit light, tannic and restraint but overall smooth, balanced and traditional in style, and, in my opinion, quite good for a 2002 vintage (which wasn't a great vintage for Rioja). Clear, medium intensity, ripe dark berry color. Lovely, very expressive nose boasting aromas of red cherry, floral, spices, slight touch of vanilla-oak, mineral, earthy notes of dirt, liquorice, clove and bitter chocolate. Not as attractive on the palate as on the nose, this wine get better with a bit of swirl in the glass, and really start to open up after a few minutes in the glass. A bit light and not as generous as the nose, at first, the palate started to express itself nicely with a bit of time. It has the same type of flavors in the palate. And despite a touch of dry tannins on the finish, I will say that this wine reveals more of this old school elegance and dryer, earthy finish, rather than the heavily overripe and oaky style from the new world oriented other wineries. Somewhat light and simple but well made for the price; the 2004 vintage surely helped a lot too, to add structure and depth. Definitely a classic Rioja! it has an interesting of attracting the surrounding light. Clear, clean, medium(+) intensity for the color, especially for a wine of this age, with old brique orange reflects on the rime and dark ripe berry, dark red-brownish autumn leaf color. The nose exposes interesting notes of dark ripe cherry, pig skin (and fat), leather, forest floor, touch of mushroom and ripe figs, with integrated oaky hints. Already in the attack, it is soft, juicy, with layers of flavors like red ripe berry, figs, liquorice, leather, spice, cloves. Long, balanced, super integrated finish with earthy, dry yet juicy tannin, and a touch of spice. Lovely. Their 2007 Can Blau (regular, sold for $16-$18) is really quite good, rich and smooth. However, the 2004 Can Blau Reserva is a monster of flavors and intensity, in the same league as some of the best Priorato wines (Priorat, Catalonia, Spain). Monsant is a little enclave in the south of Catalonia, north of Priorato. Although, usually, not as complex and mineral as the Priorato wines, Monsant wines can sometimes match them in richness and density. 2004 Can Blau Reserva is one of on these extremely intense reds. Powerful and oaky yet balanced and integrated, it boasts flavors of ripe dark berry, rich dark chocolate, moccha, earth, spice and toasted oak notes. It is a good alternative for big Cabernet and Zinfandel lovers. Pair it with something substancial like grilled steak or BBQ. Murrieta is a classic winery from the even more classic and recognized Rioja region in Spain. Their 2004 Marques de Murrieta Reserva is delightful, dense, earthy, with ripe dark fruit, excellent texture and very good tannin structure. It is, somewhat, a wine with one foot in the classic way and one foot in the more modern way. 2004, in Rioja, was in my opinion a fantastic vintage that offers lot of ripe fruit and richness and that will surely develop nicely for quite a few years. Most 2004 wines that I tasted were young and promising, but very enjoyable after 20 minutes of decantation. 2001, in Rioja, remains, for me, a reference in terms of quality, depth, complexity, strength and elegance. Most 2001 that I tasted were (for most of them) quite exceptional, especially for the more classic wineries but also for the newer style wineries. Here are some of my favorites Rioja's winery: Marques de Riscal, Bodegas Riojanas, Muga, CVNE, Lopez de Heredia, La Rioja Alta, Palacios Remondo, Bodegas Roda, Fernando Remirez de Ganuza, San Vicente, Sierra Cantabria, Contino...(and a few more...). However, let's come back to Marques de Murrieta. 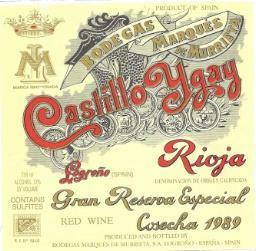 Their 2000 "Castillo Ygay", a special cuvée like a reserva or grand reserva style, is dense and smooth, complex, rich, balanced and very subtle. The robe has orange taint on the rime, sign of a little bit of age, but nothing wrong for a 2000 vintage. Ripe red cherry, oak, spice, mushroom, forest floor and floral aromas resume the nose. On the palate, it expresses flavors of dark berry and red cherry intermingled with hints of spice, earth and forest floor with integrated vanilla oak touch. The elegant mid-palate has a great acidity elevating the juiciness of the fruit and carrying it until the long-lasting dry finish. "Gouleyant" is first and above all a great french word that means: fresh, agreeable and easy to drink (when you talk about a wine). But "Gouleyant" within the same spirit as the word itself, is a simple, versatile, earthy, enjoyable, Malbec based wine made from one of the great figures of Cahors: Georges Vigouroux (et fils). Cahors is a small, medieval town located in the southwest of France, squeezed between the southeast of Dordogne and the town of Toulouse. Although, the Vigouroux family has been in the vine and wine business for nearly 150 years, it was Georges Vigouroux, the third generation of the family, who first planted vines on the hillsides of Cahors in the early 70s and really started to invest into the property. He now passed on his knowledge to his son Bertrand-Gabriel Vigouroux. From a family of vine-growers, winemakers but also Negociants for nearly a century, Georges and Bertrand-Gabriel perpetuate with great enthusiasm their family tradition of crafting wines. They own a few properties, some around Cahors including Chateau de Mercues and Chateau de Haute-Serre where they produces several Malbec based wines including Gouleyant, Atrium and Pigmentum. One can definitely say that the fame of Cahors has risen over the last 20 years due to the hard work and efforts of the Vigouroux family. This high quality yet affordable wine comes from vineyards planted on the Cahors hill slopes, planted on limestone-clay soils. Made from 80% Malbec and 20% Merlot, vinified by Bertrand-Gabriel, the wine went through a long maceration to extract a maximum of fruit and color. It was fermented then aged in stainless steel tanks to preserve the freshness and the fruit expression. 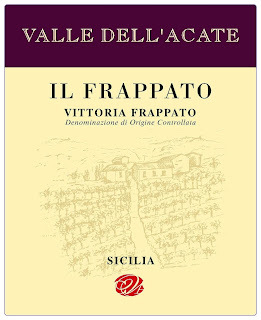 The nose is earthy, floral, with black currant and dark cherry fruit flavors mixed with hints of tobacco leaf and smoke. 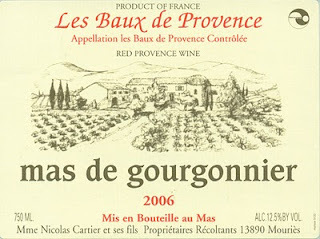 The attack is fairly juicy, with good acidity in the mid-palate followed by a lingering earthy, slightly tannic, finish. Overall, this wine is juicy with ripe fruit, smooth, earthy and food friendly. Pair it with duck, grilled on "Sarments" (aged vine shouts, cut after the harvest before the cold winter season), and served with wild mushroom like "Chanterelle".